3 3/4" wide x 2 " deep - 1995 - Permanent Collection of the Renwick Gallery, National Museum of American Art - Smithsonian Institution, Washington, DC. 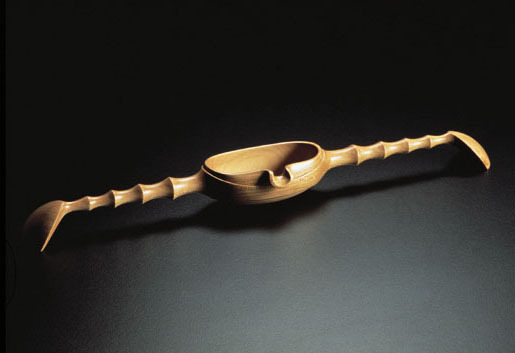 I have carved several spoons in this style suggesting a ritual use. Passed between people using both hands, the spoon suggests ceremonial use. Since I have no knowledge of such a ceremony, I titled it Spoon From a Forgotten Ceremony as if the memory was forgotten, perhaps subconscious, or even from a past life. Photography by Jim Osborn.